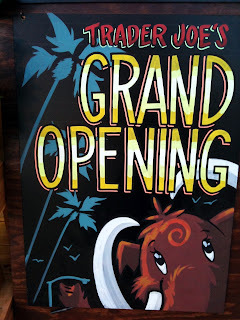 Do you have Trader Joe's where you live? The chain recently opened a store in The Wilfair's neighborhood. They're using both a prehistoric tar pits mammoth -- at least I believe that's a mammoth and not a mastodon -- and the Farmers Market clocktower as the label artwork. Yeah, it's adorable. It is also a testament to an interesting neighborhood; the Wilshire/Fairfax area boasts multiple go-to symbols. Yet another reason it was a natural fit for the Wilfair books, in my mind. 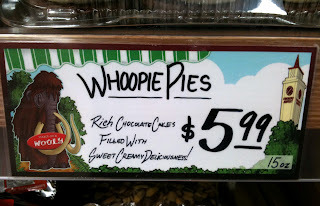 Also, whoopie pies, next to a cartoon mammoth? These are the everyday things that make me laugh. What are the symbols of your city? Are they as hairy as a mammoth? 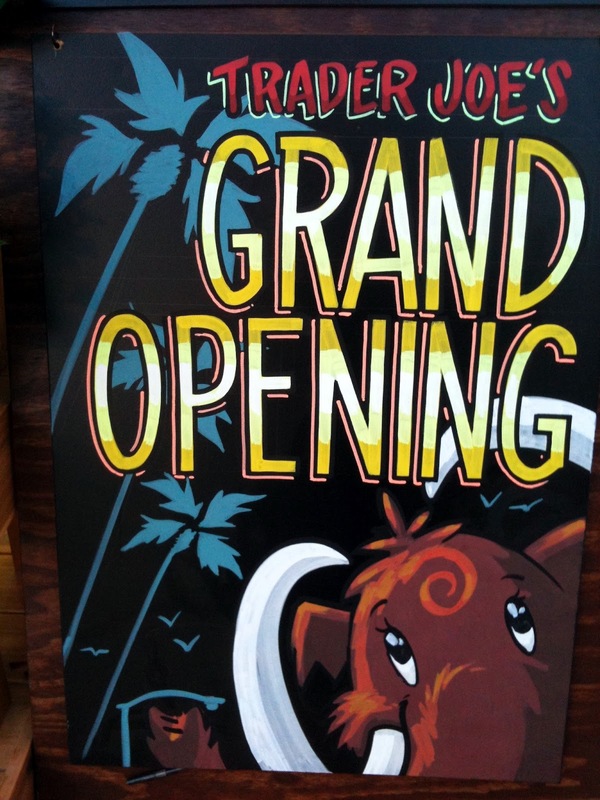 No Trader Joe's in Oklahoma. :( I almost got to one while I was visiting my aunt in California but riding all of the rides at what used to be Paramount's Great America and then the winding road through the mountains caused me to be extremely carsick so I had to recover in the car while everyone else shopped. So pitiful... I live near Oklahoma City and the "mascot" is bisons. There are various decorated bison statues throughout the city and the NBA Oklahoma City Thunder's mascot is Rumble the Bison. I consider bison pretty big and furry! One word: soyrizo. So delicious! Soy chorizo! Chorizo without the guilt! (or in my case, the stubborn refusal to consider what I am actually eating) Trader Joe's makes an excellent soyrizo which is fantastic in a breakfast burrito. Peppermint JoeJoe's are also amazing when Christmas rolls around. It's an Oreo with crushed peppermint pieces. So yummy! As for San Diego, I haven't been paying attention to what the symbols of the place are. myrandaroyann: Rumble the Bison! I'm obsessed with all things bison. I may have to do a full post, in fact. 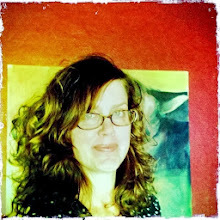 Erika: I'm off to TJ's this minute so perhaps I shall soyrizo-up my basket. Thanks for the tip! Hmm. When I think San Diego I think zoo and marine animals. Or maybe the Gaslamp? Balboa Park? One of my best friends is moving there so I'll visit more. I love your city! I think for my town, it would be anything to do with mines and mining. There are no mines anymore but it used to be a mining town and there's is still one old one that is a monument now and in the main square in town there is a statue of a miner called "Joep". Oh, statues! Another obsession of mine, especially the unusual ones or the ones that pay tribute to smaller deeds. Statues of heroic animals, like dogs who saved people, always get me. I haven't figured out if my new city has any signature animals yet (aside from sports mascots) but my neighborhood has definitely adopted the pink flamingo as it's symbol. They're everywhere! Including a two-story tall one on the front of a restaurant and sometime painted in different colors. One of the towns I grew up in had a huge whale statue that was hollow so you could climb around inside. Her name was Connie. The site is in Dutch but there are pictures of Joep. Also Joep is a typical Dutch name, it's the Dutch version of Joseph. Bess, Connie sounds kinda awesome! Joep! How interesting. Is he holding a lantern? What is that? Thanks for sharing, Chiara. He's a very noble-looking character. Yes, he's holding a lantern, a miner's lantern to be exact. Our town is the oldest mining town in The Netherlands and the mines used to be the largest employers so the town wanted a monument to represent all of that and it serves as a tribute to all the workers that lost their lives in the mines. This blog has become like a little class for me and I'm the willing student. :) Thanks, Chiara! Learning about other places=Alysia's favorite thing ever.